Saying that they offer high control flexibility and easy maintenance to match various applications, such as light commercial building, offices and shops, Lennox has introduced its Armonia range of water cassettes. The company claims that extended technical and design development has led to achieve the highest level in terms of product performance, silent operation and control possibilities. They come in seven different models – four models are available in 600x600mm to fit on to standard module false ceilings and three models are available in 800x800mm. Each model can be delivered in two-pipe, two-pipe+electrical heater, and four-pipe systems. The two-pipe system is equipped with one, two or three rows of coil according to the size. The four–pipe applications come with one+one or two+one rows of coils. But the company can also offer a version optimised for cooling with enhanced cooling coil and less capacity in heating. The float switches come with centrifugal pump supply as standard with the unit. The units can also be delivered fitted with two or three-way valves. The fan mounted on anti-vibrating supports is extremely silent, thanks to wing profile blades with a shape that reduces turbulence, increases efficiency and reduces noise. Comes with six-speed electric motors as standard. But the company can also provide the product with an e-Drive version. This means that EC motor (brushless) with inverter card is fitted on to the unit. The motor can be, then, driven directly with 1-10V signal to allow continuous air flow variations. The range facilitates electric consumption of less than 50% compared to AC motors. The system is fully compliant with the Electromagnetic Compatibility Directive. 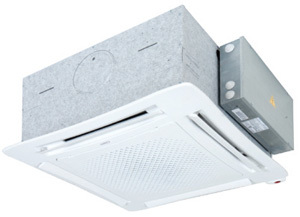 Two air outlets on the side of the units facilitate connection to separate supply air outlets and can provide air to distant areas of a room or even to a different room. The company also offers a wide range of remote or infra-red controls, master/slave, and with communication capability. They are equipped with adjustable air distribution louvres on each side. Made from standard white ABS, RAL 9003, they are aesthetically attractive. They can also be made available in metallic diffuser for 600x600mm dimension to fit into a false ceiling standard module without overlapping parts.